SYRACUSE, N.Y. ­ State University College of Environmental Science and Forestry (ESF) President Ross S. Whaley announced he will leave his position as president effective July 1, 1999. "We are fiscally, programmatically, and physically strong. We have well-qualified leadershipand we have developed a good working relationship with the SUNY Administration and Board of Trustees," said Whaley. "It is a time when a new president could devote his or her attention to an exciting future for ESF without the encumbrance of a long list of problems." "During his more than 14 years of leadership at the State University College of Environmental Science and Forestry, President Ross S. Whaley has established an admirable reputation for himself and that institution," said SUNY Chancellor John W. Ryan. "The State University is indebted to him for his loyalty, dedication, and excellence of service. He has brought prestige to the college and the university during his tenure as president." Ryan said he would recommend to the SUNY Board of Trustees that Whaley be named a "university professor." That title, said Ryan, "recognizes his enormous contributions and allows him to continue his exemplary service to the college and the university." 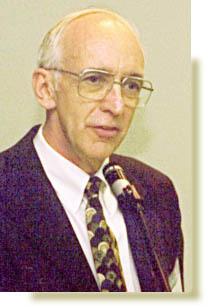 Whaley was appointed president of ESF April 1, 1984, leaving a position as director of forest economics research with the U.S. Forest Service in Washington, D.C. He also held teaching and administrative positions at the University of Massachusetts, Colorado State University, and Utah State University. Whaley is a nationally recognized expert on natural resource management and development. During his tenure as president, Whaley oversaw both ESF's physical and programmatic expansion. The new Edwin C. Jahn Laboratory, completed last year, leads a major campus renovation program that follows with significant upgrades to the Ranger School in Wanakena and the Hugh P. Baker Laboratory on the main campus beginning this year. Under his leadership, a number of interdisciplinary and cooperative academic programs were created including initiatives in writing, computing, biotechnology, geographic information systems, renewable materials, and science education. Sponsored research program annual expenditures doubled to $6.2 million in FY '97-98. Student applications to the college have risen steadily during the last 14 years, and Whaley initiated a number of programs to significantly increase student and staff diversity. In addition to his duties as ESF president, Whaley has pursued an impressive array of public and professional service activities. These include chairmanship of the State Needs Task Force on Environmental Conservation and the Governor's Task Force on Forest Industry. He was president of the Society of American Foresters in 1991. Whaley served as a member of the board of the Pinchot Institute of Conservation Studies and as the board's president in 1992. He also was a member of the Governor's Interstate Task Force on Northern Forest Lands. A national search will begin immediately to find a successor to Whaley.